Looking for a garage in Corby for your car service? No need to ring around or hang on the phone – find and book it online quickly and easily with BookMyGarage. Simply enter your registration number and postcode, choose a Corby garage and make your booking. You won’t pay a penny until the work is complete. "I’m so happy with the work & how it was all explained to me in a video sent of the work being carried out, I’ve recommended to everyone as the service & prices you get here are unbeatable!" "For me the service was second to none.was always kept informed of what was going on.friendly staff and liked the idea of the video showing you what work was needed and done.will definitely use again and again." "Good experience, and liked the videos. Although indicator lights on dashboard have not worked since MOT & Service - and they worked before..."
"The garage looks after a number of our vehicles, from vans to 4x4 to performance cars. Good service, competitively priced. Will continue to use. Thanks"
"The booking system was very easy, helpful staff who arranged my lift home and the Service itself was great...but...was very disappointed that my car had not been cleaned in and out...I have always had this with a 'Big' Service...really let down the overall customer experience." It’s time for your car's service again - so where do you take your car? The same garage as before - although last time you were worried you were overcharged. Here at BookMyGarage we have 4 garages in Corby for you to choose from, all rated by other car owners and offering fixed prices for their services. You can compare labour rates too, helpful if you’re thinking of additional car repairs you might need. We display transparent prices for car services, but you might want to consider calling our expert mechanics 03304 00 44 39 for independent and unbiased advice if you think you need a costly repair. What is most important for you when you’re booking in your car’s service? For many people working in or near Corby, it’s about finding a time that fits around office hours, school pick-ups or nursery drop-offs; BookMyGarage can help here by telling you which garages offer car collection and/or a loan car while yours is out of action. Hanging on the phone while you try to get on with the rest of your life is not ideal so the option to book online with a service such as BookMyGarage can prove invaluable. Of course, you also want a garage you can trust which is where the star ratings from other car owners in Corby come in, to help you make the right choice. 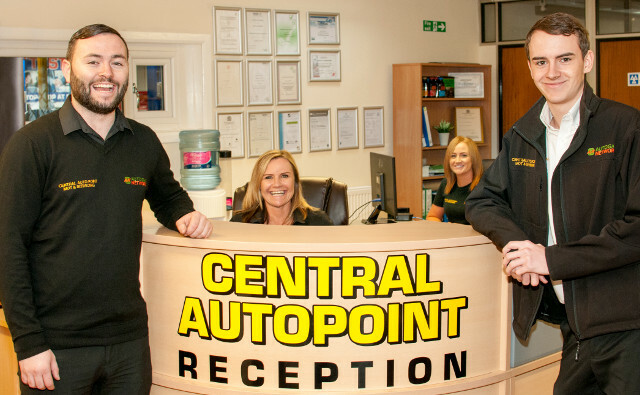 Do you know how often you should get your car serviced and what type of service you need? There is no hard and fast rule - it depends on the model of car you have and its age. You should find this information in your car owner’s manual. If you’re not sure, enter your mileage on BookMyGarage and we’ll help you decide. As a general recommendation, you should be taking your car for a Full Service every 12 months (or 12,000 miles) and a Major Service every couple of years (or 24,000 miles). If you’re regularly travelling far beyond Corby for work or to visit relatives, or you have a car with known issues, it’s worth getting an Interim Service every 6 months (or 6,000 miles). A common car problem which is worth taking action on fast is a faulty alternator. The alternator is a simple but key part in your car - as well as powering your headlights it gives your battery the power it needs to start the car, so it’s pretty important. There are a few signs to look out for if your alternator is starting to fail, from dimmed headlights when you’re driving around Corby at night or a light appearing on the dashboard, to a growling sound or unusual smell coming from the engine. If you spot any of these, find a Corby garage on BookMyGarage and get your car checked out. Prices for a replacement alternator can vary a lot depending on the make and model of your car, but are generally around £200-£300. We all have different needs, and choosing a garage is no different. For some of us, it’s the quality of the overall service which matters most; not just the work that’s done under the bonnet, but the human interaction that comes with it. BookMyGarage allows you to compare Corby garages on everything from their waiting room refreshments or whether having your toddler in tow is going to be a problem, to how clearly the staff can explain the work your car requires.